In February 2009, post a hectic Marghazhi, Sudha found solace in her trips to Isha Foundation. The ambience, the interactions with Sadhguru, the camaraderie amongst fellow disciples and the absorbing of the clean mountain air, all of it rejuvenated her and instilled in her greater strength and peace of mind. 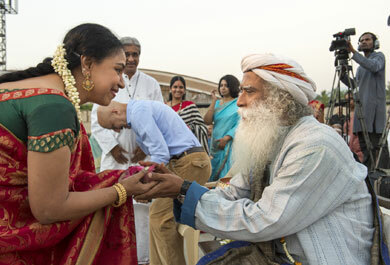 Sudha has always looked up to Sadhguru for advice and guidance – to face life with a smile, to overcome all the challenges that she may face in her arduous journey to spread her music across the globe, to make use of all the opportunities given by the Almighty and to lead a fulfilled life. Apart from this, Sudha is also an active participant in many prominent festivals and interactions at the Isha Foundation. Sudha reminisces, “In July 2007, I took time off my routine work and attended the ‘WHOLENESS’ Program of Isha Foundation at Poondy, off Coimbatore. Sadhguru Jaggi Vasudev himself spearheaded the events and there were about two hundred and fifty of us from different parts of India. He addressed us twice a day, enlightening us with some wonderful, amazing, practical anecdotes and tips. I felt like being born again, so pure, so sublime, so innocent, so untouched by the trials of life. My perceptions have transformed so much after the weeklong session that I would refrain from ever using the word ‘trial’ now!